Can you imagine a pizza so good that people who have eaten it have enjoyed it so much that they can’t stand to be without it? When the craving hits, and believe that it will, you will go to great lengths to be able to enjoy a Fricano's pizza just one more time. 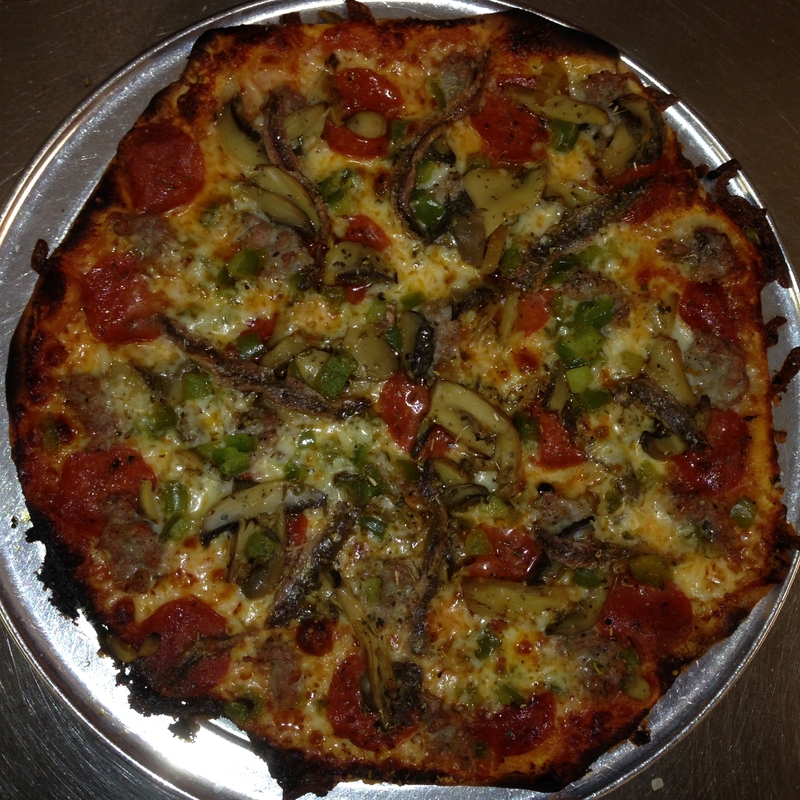 Pepperoni, Italian Sausage, Mushrooms, Green peppers, and Anchovies. 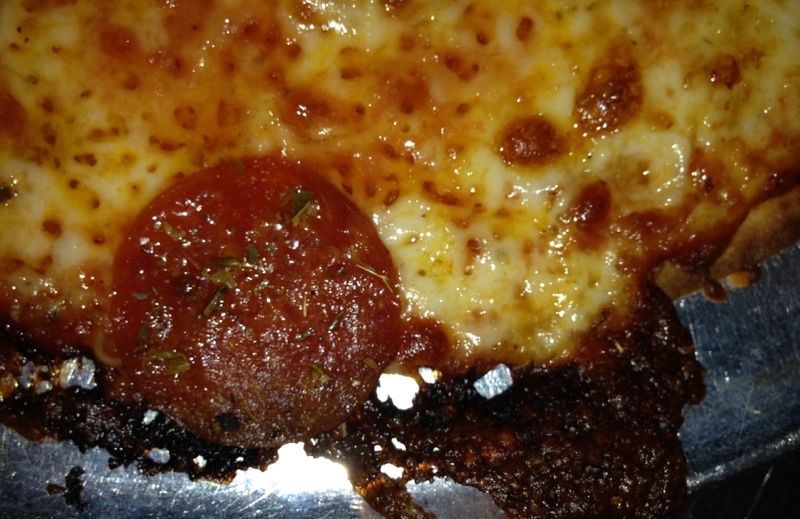 This is the standard Fricano's EBA Pizza fresh from the oven. 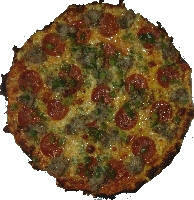 The Everything But Anchovies (Pepperoni, Italian Sausage, Mushroom & Green Pepper) or better known to many as the "EBA". Customers of over 30 years still think that it's the only style we make because it is such a popular request. But there are other options. 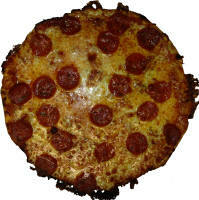 Any combination of the five toppings will result in just a little variation from the other but always the unique and delicious Fricano's pizza taste. 8 pizzas in the oven. Doug Fricano carefully checks the pizzas to see if they are done. 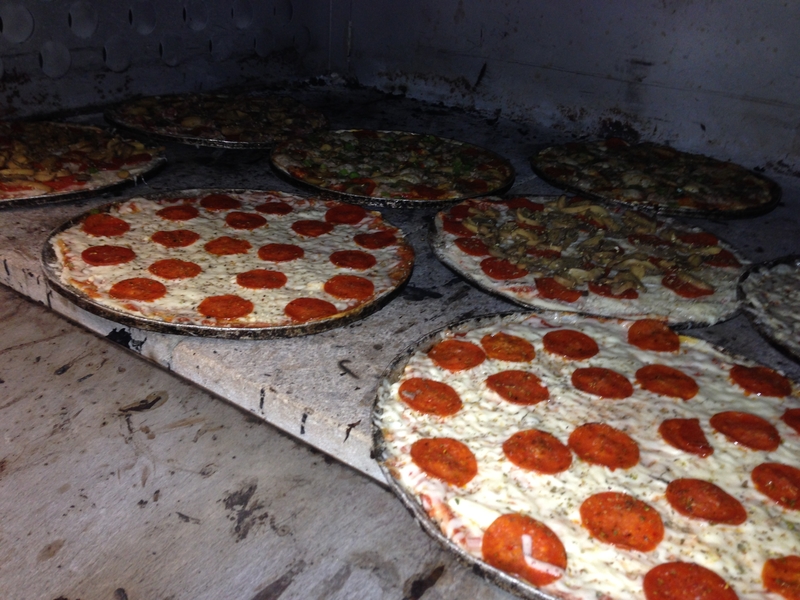 The pizzas are rotated to make sure they cook evenly, thoroughly and do not get burned. 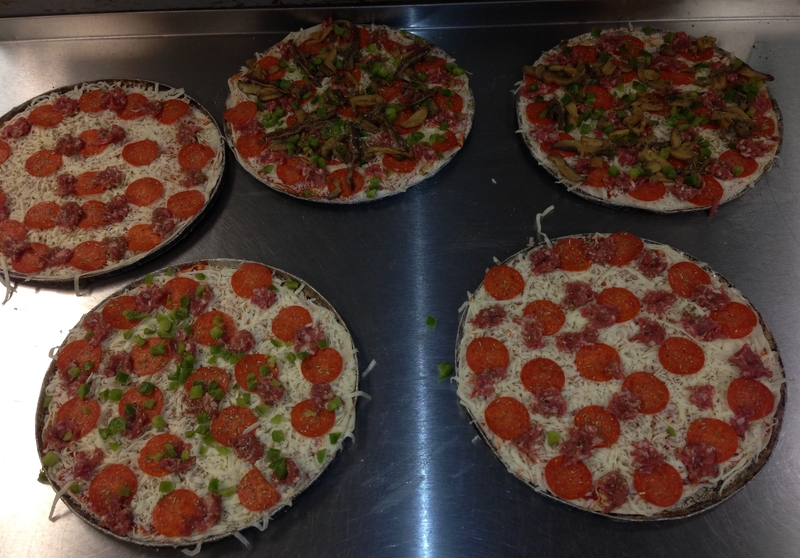 You can count on getting a perfect Fricano's pizza every time because Doug takes great pride in the finished pizza and is truly succeeding in his quest to serve the best pizzas he can. 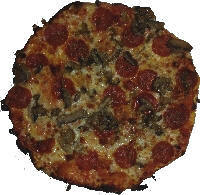 A Fricano's Sausage and Mushroom pizza. 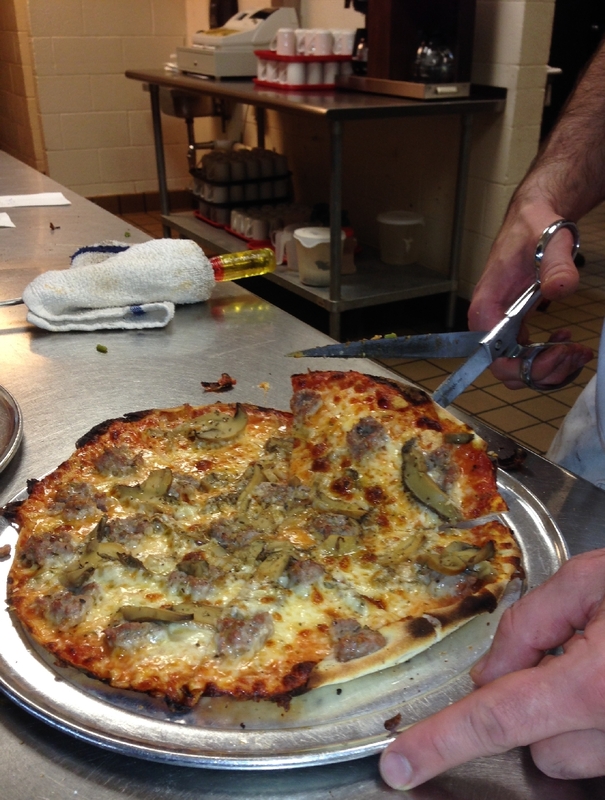 We use scissors instead of a pizza cutter because it works much better with our pizza. cheese with your very own eyes. You can see for yourself the quality that the Fricano's use and pride themselves on for last 60 years. A Fricano's pepperoni and Italian sausage pizza. This is also a very popular request. Doug is quick to praise his crew of 30-40 hard working employees he recruited from the area neighborhoods for doing such a good job building these fantastic pizza pies and working so well with him and his customers. It's hard to believe they look this innocent before they are cooked. In this picture, expecially left of the middle, you can see the thickness of the very thin crust, which is one of the most important aspects of this amazing pizza. 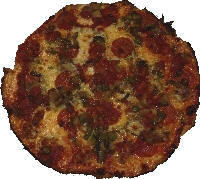 The flaky thin crust is browned on the bottom and on top is merged with the sauce where it meets the cheese and oils. The texture is crispy, browned, firm, never soggy and easy to chew. 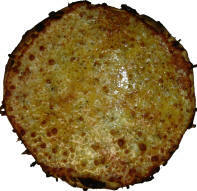 Although very thin, the crust is strong enough to hold its weight without bending when a slice is picked up. 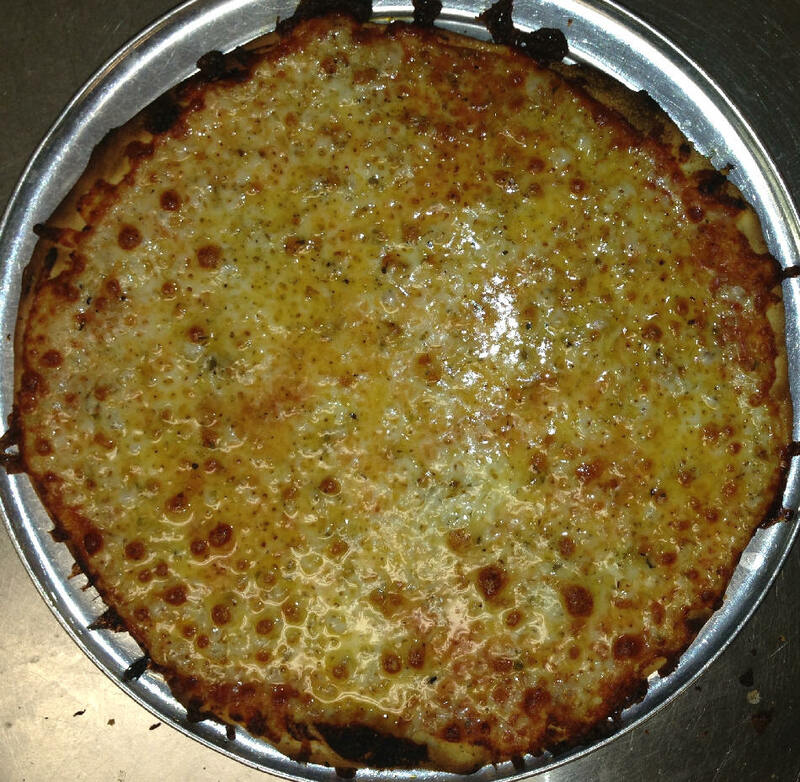 The browned cheese (most customers love it even when the cheese sears to the outer edge of the crust) is said to be one of the best parts. 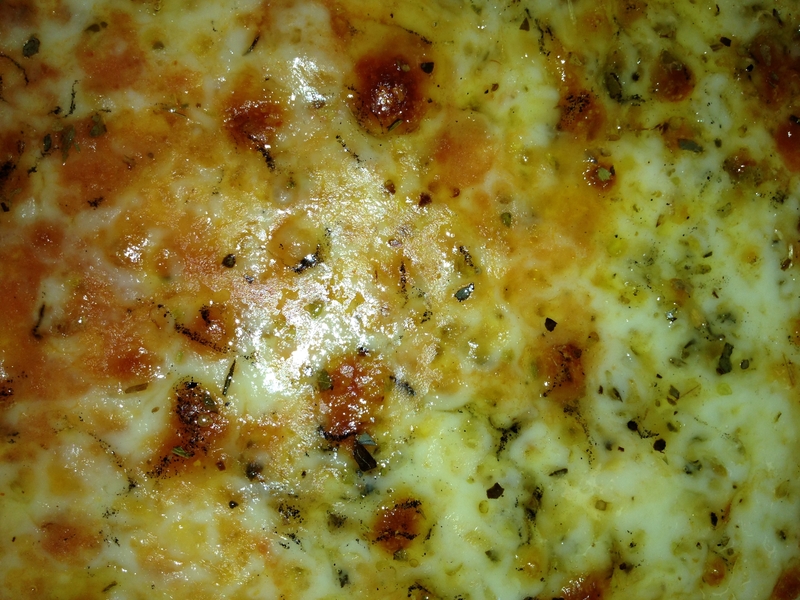 The cheese is not very stringy because it is thoroughly cooked and separated from the oils and has absorbed the sauce. The Toppings are of the very highest quality. 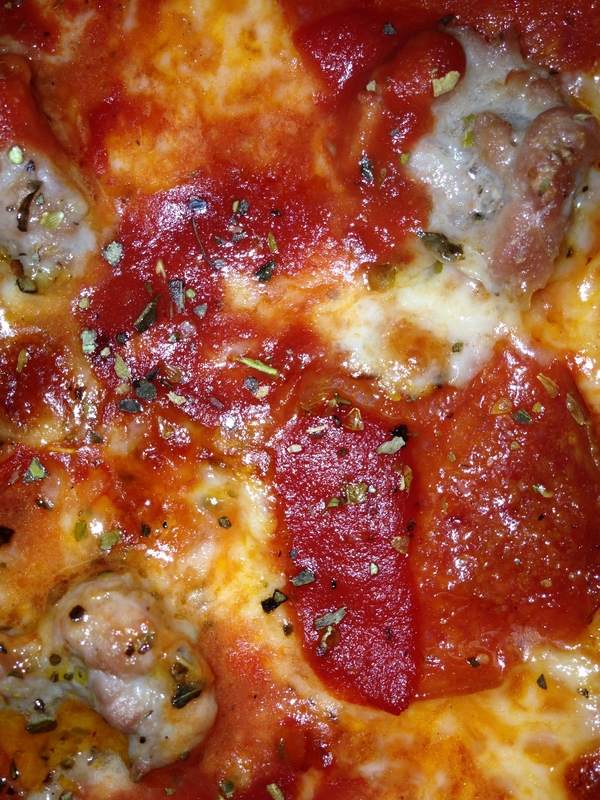 The Italian Sausage is mixed and seasoned in-house. The Pepperonis are pleasantly zesty. The imported Mushrooms are big and bountiful. The Green Peppers are finely diced and fresh. The Anchovies are always fresh and also imported from the Mediterranean. No Onions are available even though many new customers ask for them. It is not necessary for a Fricano's pizza to have onions on it because they damage the taste and our five toppings are all that is needed to create top quality pizzas. Our pizzas are topped off with a combination of complimenting spices that are called bird seed by our customers (actually it doesn't resemble bird seed at all, it's flakes more than seed.) Gus' sister Genevieve coined the phrase "bird seed" years ago and it has stuck ever since. 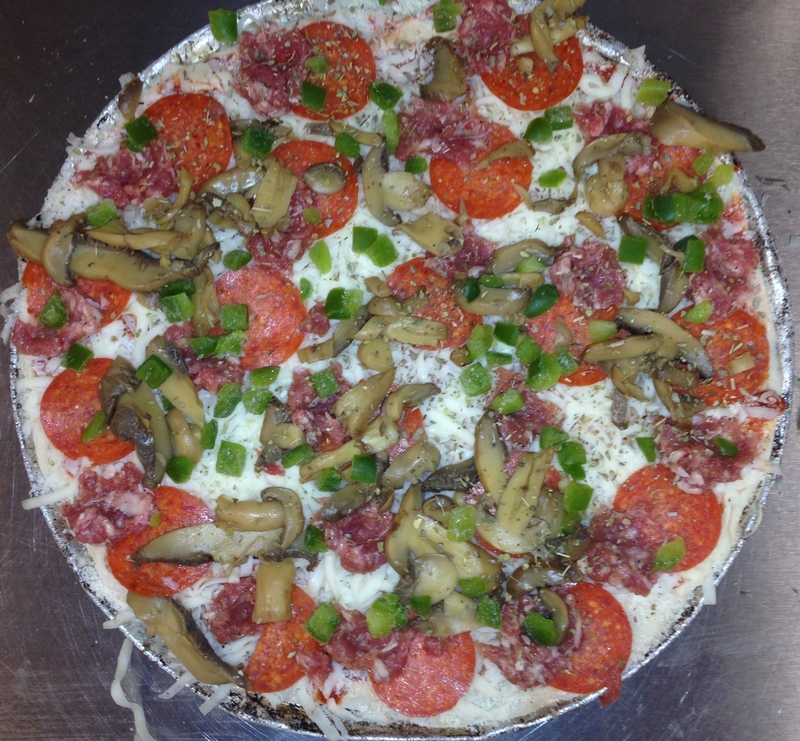 The ingredients in a Fricano's Pizza are real and no different than in 1949. There are no artificial or processed ingredients, MSG, artificial flavors, fake sugars, high fructose corn syrup, etc. Take a close look at these pictures, you have my word that this is real food. From the very beginning Gus Fricano knew that quality ingredients in the right proportions made specifically to the recipe had everything to do with the success of the pizza product. Fricano's Pizza is the best most wholesome quality ingredients that money can buy. 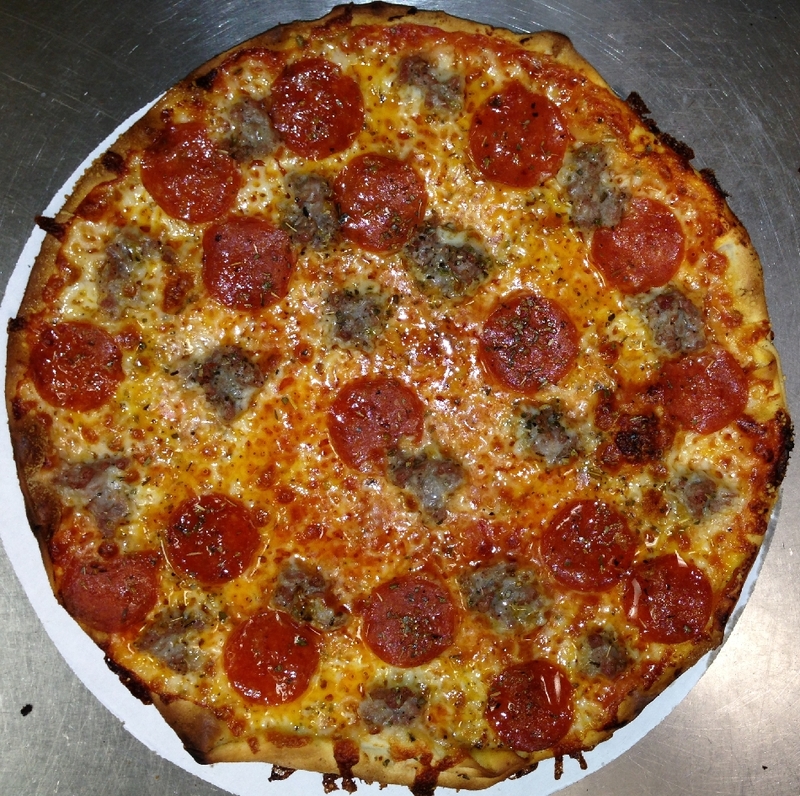 From the flour to the Wisconsin made blend of cheese to the tomato paste to the fresh ground pork and the top quality custom special pepperoni made for Fricano's only. That is why Fricano's is so different. What is a Fricano's Pizza? Our pizzas are a combination of many top quality ingredients balanced with all the right spice in just the right proportions carefully baked in extremely hot ovens. All done under the watchful eye of Doug Fricano. He demands that every pizza that comes out is baked the same as when Gus opened his own oven door to pull the first one out way back in 1950. Tradition does mean a lot when talking about the Fricano's pizza pie. The most remarkable aspect of Fricano's pizza is that it is very tasty with intriguingly tangy, spicy and other pronounced flavors. It is difficult to describe Fricano's pizza with just words and pictures because you must sample it yourself to understand why it has achieved legendary status. The Smell and Appearance are amazing. We never compromise on the quality of our ingredients. Fricano's Pizza is very low in carbohydrates. Nutritional Information is available upon request. How far would you travel for a pizza? Probably to the nearest location down the street and order the same o, same o, pizza you could get from any pizza joint in town. Most pizzerias order the same supplies from all the same food distributors and make basically the same mundane, run-of-the-mill pizza. Fricano's pizza is nothing like any of these at all. Totally different in appearance, aroma, and most of all, taste. Why else would the Fricano faithful travel 20 to 30 miles on a weekly or monthly basis in their quest for this unique and addictive taste? At the Grand Haven location to travel from Grand Rapids, Holland, Ludington, New Era, Jenison, Hudsonville, Muskegon, and beyond is the norm. 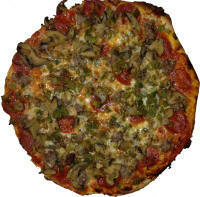 Fricano's Pizza has appealed to so many people for so many years that they have cultivated patrons from other states. 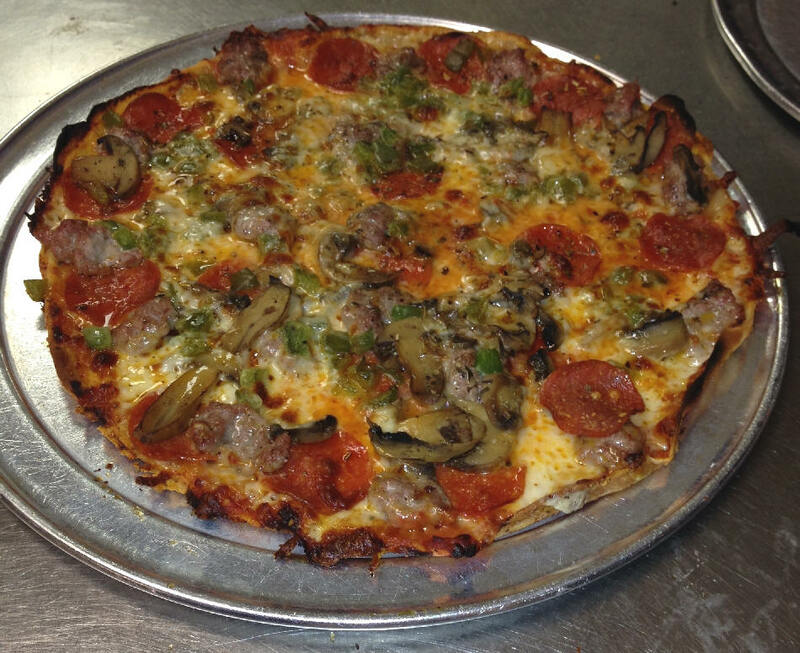 The incredible Fricano's pizza has stood the test of time. Our pizzas, including our famous EBA (Everything but Anchovies) Pizza are completely unchanged for 65 years. People are excited about the new locations in Grand Rapids, MI, Fricano's Pizza, and Muskegon, MI, Fricano's Muskegon Lake, serving perfect Fricano's pizzas known at the Grand Haven, MI location for over 60 years, the Alamo, MI location and the Holland, MI location for over 30 years. The reputation we have achieved and mystical nature of our pizza and history comes from our customers knowing and supporting the best pizza that we can make, and they are thankful that we have never changed our pizza recipe or quality of ingredients. Some travel 20 to 30 miles on a weekly basis for this famous Fricano's Pizza on their quest to satisfy their craving for that wonderful flavor that comes from one of these pizzas. 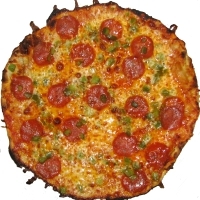 The customers like many characteristics of the pizza and many admit their addiction to it. The intriguingly tangy and spicy flavors that seem to always taste a little different to them but always exceptional.